Celeriac differs from other root vegetables in that it is not very starchy, which is a benefit if you are trying to reduce the carbohydrates in your diet. It is also known as celery root, knob celery, or turnip-rooted celery. It is a variety of celery grown for the purpose of using its shoots and roots, which have a mild flavor reminiscent of celery. 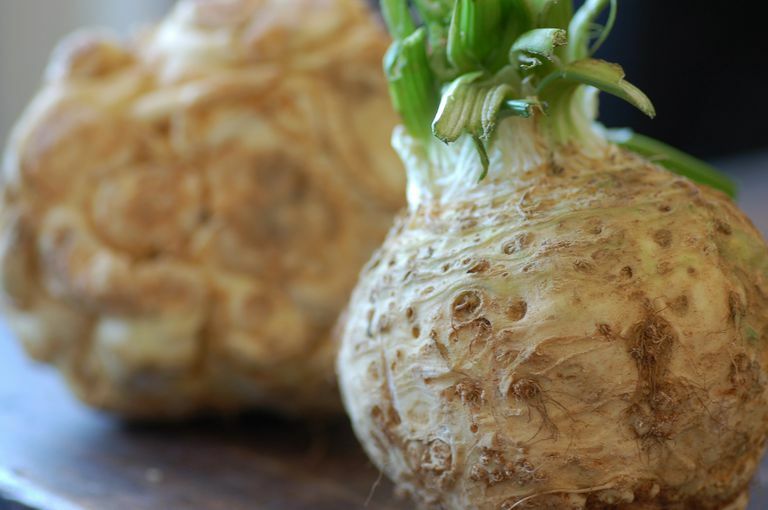 Celeriac is a little intimidating when you first look at it, as it's quite knobbly and rough in appearance. But with the right recipe and a more in-depth look, you can make celery root a staple in your low-carb diet. You just have to take a deep breath and a sharp knife and cut off the brown part. Learning how to peel celeriac takes a little practice. Then you can slice it or chop it to use in recipes. *In the USDA database, "1 cup of raw celeriac" is stated as being equal to 156 grams of the vegetable, which is a little over 5 1/2 ounces. This may not correlate with what it weighs in different ways of preparing and using it. After experimenting and weighing several different celery roots that were sliced, chopped, and processed into small pieces, a weight of between 3 and 4 ounces per cup seems more typical. Therefore, in a rare departure from the database, the table shown uses 3 1/2 ounces (about 100 grams) to equal one cup. If you want to be sure, it's probably more accurate to weigh it using your own preparation method. The glycemic index of a food is an indicator of how much and how fast a food raises your blood sugar. There is no scientific study of the glycemic index of celeriac, as it is assumed to be low because it is a non-starchy vegetable. The glycemic load takes into account how much of a food is eaten. A glycemic load under 55 is considered to be low. Like celery, celeriac is an excellent source of vitamin K. It is also a very good source of fiber, a good source of Vitamin C and phosphorus. It is a fair source of potassium. Celeriac can be used instead of potato in many recipes, such as beef vegetable soup, stews, latkes (potato pancakes), gratins, "rice" (chopped in a food processor), and pureed. You can even turn it into a celeriac chip snack to substitute for potato chips. You can also experiment with eating it raw by tossing or grating it into salads. To find the freshest celeriac and enjoy the unique taste, pick the heavier ones with no soft spots and few rootlets. You won't be disappointed in how smooth it purees, it is a root vegetable after all. The mild taste lends itself to the best combination of herbs and spices. Atkinson FS, Foster-Powell K, Brand-Miller JC. International Tables of Glycemic Index and Glycemic Load Values: 2008. Diabetes Care. 2008;31(12):2281-2283. doi:10.2337/dc08-1239. USDA National Nutrient Database for Standard Reference, United States Department of Agriculture. https://ndb.nal.usda.gov/ndb/. Are the Tons of Carbs in Mangoes Worth It? How Can You Use Tomatillos in a Low-Carb Diet?